Footstep of Lord Buddha- as the name says this tour follows the Buddha footsteps from Bodh Gaya, where he attained enlightenment; to Sarnath where he preached his first sermon; through other places he visited regularly, and finally to Kushinagar where he attained Parinirvana in 486 BC. This nine day, guided tour will allow you to see the journey of Siddartha Gautama and how he achieved enlightenment and became a "Buddha" - an enlightened one. 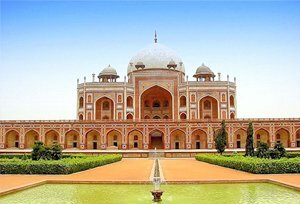 The tour starts with sightseeing tour of Delhi where you will explore some popular attractions of Delhi like India Gate, Jama Masjid, Raj Ghat, Red Fort..etc. After witnessing the beauty of Delhi, board a train for Lucknow and then drive to Shravasti. In Shravasti, Buddha spent 24 rainy days when his disciple built a monastery for him at Jetavana and even performed some miracles when a rival challenged him. Uncover the monasteries, temples and gardens at Shravasti and then make way to Lumbini in Nepal. Reckoned as the birthplace of Buddha, here you can visit the Lumbini Park, Mayadevi temple, and China temple. A world heritage site, Lumbini has an enormous religious significance and attracts Buddhist pilgrims from around the world. Next day, drive to Kushinagar, the place where Gautama Buddha attained Parinirvana after his death. 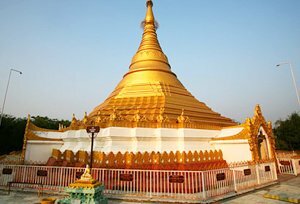 When in Kushinagar, you will visit the Mahaparinirvana Temple, Kushinagar Museum, Ramabhar Stupa and Sun Temple. Following a day trip to Kushinagar, travel to Varanasi. From Varanasi, visit the Sarnath, the ancient town where Buddha came to preach his message of the middle way to nirvana after he achieved enlightenment. Further, visit Bodh Gaya to visit Mahabodhi Temple Complex, which features a black statue of Lord Buddha in a sitting position; Bodhi Tree, the tree under which Buddha meditated to gain supreme knowledge and a stupa calledAnimesh Lochan Chaitya. Explore Bodh Gaya for a day and next day proceed to Patna via Rajgir and Nalanda. When in Patna, board a flight or train for the journey onward. If you wish to know more about this package, go through the itinerary mentioned below. Tour My India will also provide you with the option of customized packages. On arrival in Delhi, meet our representative, who will transfer you to a hotel in Delhi. The evening will be free for leisure. Today, you will visit Raj Ghat, Shanti Vana, Jama Masjid, Qutub Minar, Humayun Tomb, India gate, and Lakshmi Narayan Temple. During the sightseeing tour, you will pass by Red Fort, Rashtrapati Bhavan, Parliament House and famous Secretariat buildings. In the evening, go to railway station to board a flight for Lucknow. Upon arrival in Lucknow, drive to Sravasti. Dinner and overnight stay at the Sravasti hotel. Post breakfast at the hotel go for a city sightseeing tour. Today, you will visit the Ananda Bodhi tree where Lord Buddha meditated for a night then visit Jetavan where Lord Buddha performed some miracle. In the afternoon, drive to Lumbini in Nepal. Dinner and overnight stay at the Lumbini hotel. Post breakfast at the hotel, visit Lumbini Park, Mayadevi temple, and China temple. Dinner and overnight stay at the Lumbini hotel. After enjoying a scrumptious breakfast at the Lumbini hotel, drive to Kushinagar. Upon arrival, you will be transferred to a hotel and then proceed for city tour. Today, you will visit Mahaparinirvana Temple, Kushinagar Museum, Ramabhar Stupa and Sun Temple. Dinner and overnight stay at Kushinagar. Breakfast at the hotel and drive to Varanasi. On arrival at Varanasi check-in at the hotel. Overnight stay at the hotel. In the morning, go for a boat ride along the Ganges. After a quintessential Varanasi experience, go back to the hotel for breakfast. In the first half, visit Vishwanath Temple, Bharat Mata Temple, and Tulsi Manas Temple. Later, in the second half, visit Sarnath (where Buddha delivered his first sermon). 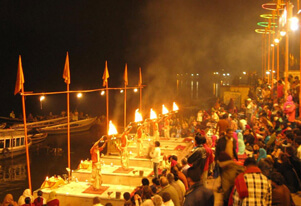 After a brief sightseeing tour, return to Varanasi to see the evening Ganga Aarti. Dinner and overnight stay at the Varanasi hotel. After breakfast, drive to Bodh Gaya. On arrival at Bodh Gaya, check-in at the hotel. Later, visit Mahabodhi Temple, which includes tall stone lotuses, figures of Buddha sitting in different postures on the walls, his footprints on the stones and a colossal golden Buddha in the sanctum sanctorum. The Bodhi Tree is situated in the premises of the temple, is the one under which Buddha attained illumination. Dinner and overnight stay at the Bodh Gaya hotel. After breakfast in the morning, drive to Patna. 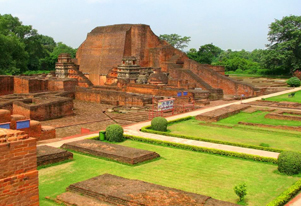 En-route, visit Nalanda University, founded in the 5th century B.C. Also, pay a visit to the archeological museum that exhibits the Nalanda University seal, sculptures and other remains found on the site. Later take a 20 km drive to Rajgir. Further, visit Griddhkuta "Hill of Vultures", where Buddha delivered some of his most famous sermons. After that, visit Saptparni caves where first Buddha Council was held which is also the source of Rajgir's hot springs. Later continue drive to Patna. On arrival at Patna check-in at the hotel. Overnight stay at the hotel. Post breakfast, drive to railway station or airport to board a train or flight to journey onwards.